I must admit I truly enjoy a good sci-fi story. Ken Garing’s Planetoid Praxis is a continuation of his Planetoid story series from 2012-2013. 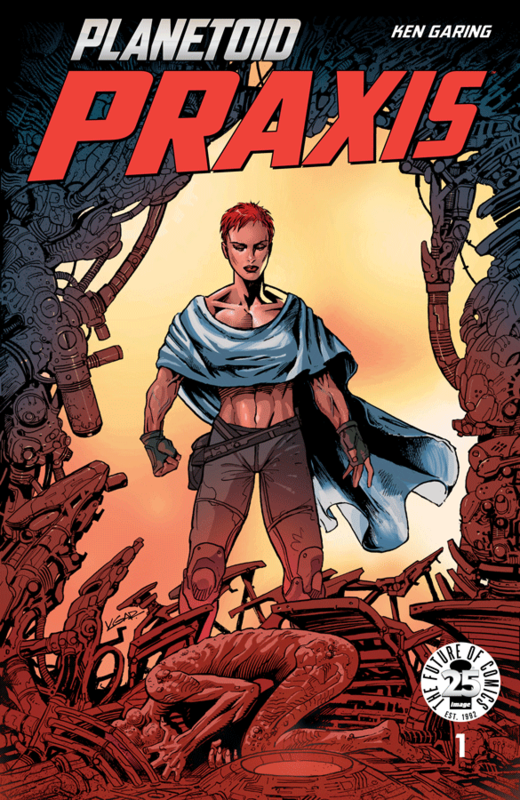 After reading Praxis, I must admit, I have to go back and read the original series because I feel hooked back in. The current story begins as though it was printed in Heavy Metal or Epic Magazine. We get a curious traveler that wanders a techno world that looks like it has seen better planet cycles. Our traveler moves with grace and wonderment until he comes across some children. Our traveler has a goal to find a settlement that the children and their parents inhabit. Like many sci-fi stories, paranoid sets in quickly and some secrets about our traveler comes to light and we get the moral issue with the story. This should make the following issues intriguing. Ken’s artwork is sharp and detailed. It reminds me a little of Brian Boland’s work, but slightly better. The characters fill the space properly and the alien designs are fantastic. Ken ends the book with a little story about his life and how Praxis came to be. At this point it’s kinda a shame that this might be a stand alone story and not an ongoing extended series as this was a solid addition to the Planetoid lore.